Reconnect as a family and share a weekend hiking to a hidden waterfall, snacking on cherries along Oregon’s Fruit Loop and cutting lavender from a field that hums with honey bees busy at work. 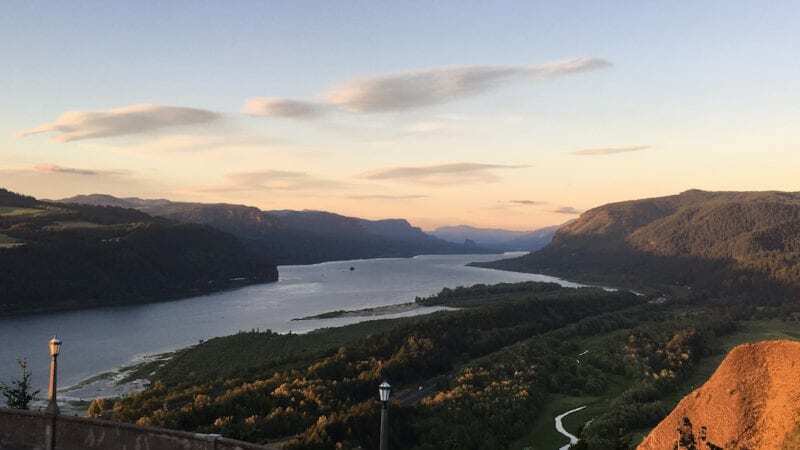 I found all of this nestled along U.S. Route 30 that meanders through the Columbia River Gorge National Scenic Area, one of the best scenic routes in the country. Driving U.S. Route 30 through the Columbia River Gorge National Scenic Area in northern Oregon is tops for scenery. A leisurely drive to-or-from Portland that offers waterfalls, orchards and lavender fields. On my recent road trip, I stopped in historic The Dalles and spent the night at the Cousins Country Inn. 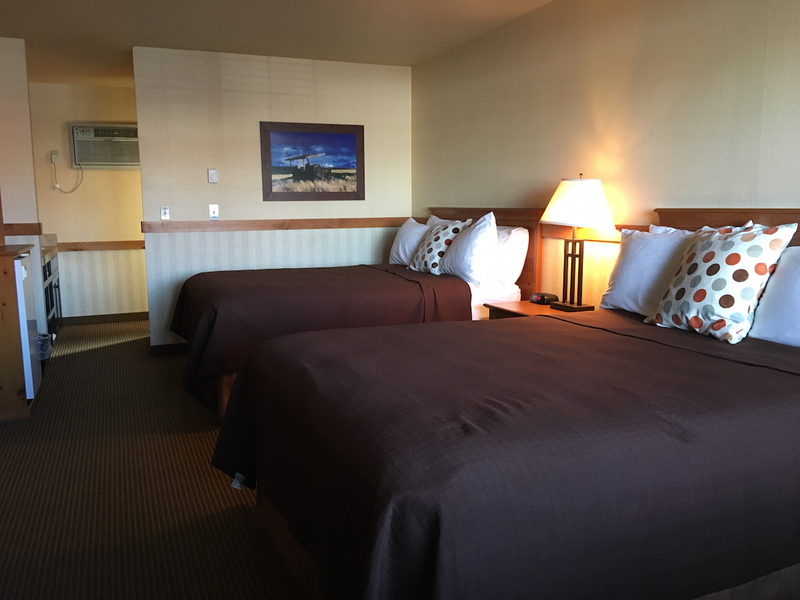 A roadside lodging option that offers families with kids or pets a convenient location to spend the night along the Columbia River’s U.S. Route 30 or Interstate 84. As I walked through the door, the front desk staff of Cousins Country Inn welcomed me with a smile and fresh-baked cookies with a cup of hot coffee. I caught a whiff of pot roast that lured me and my kids into the Cousins Country Restaurant, located next to the lobby. 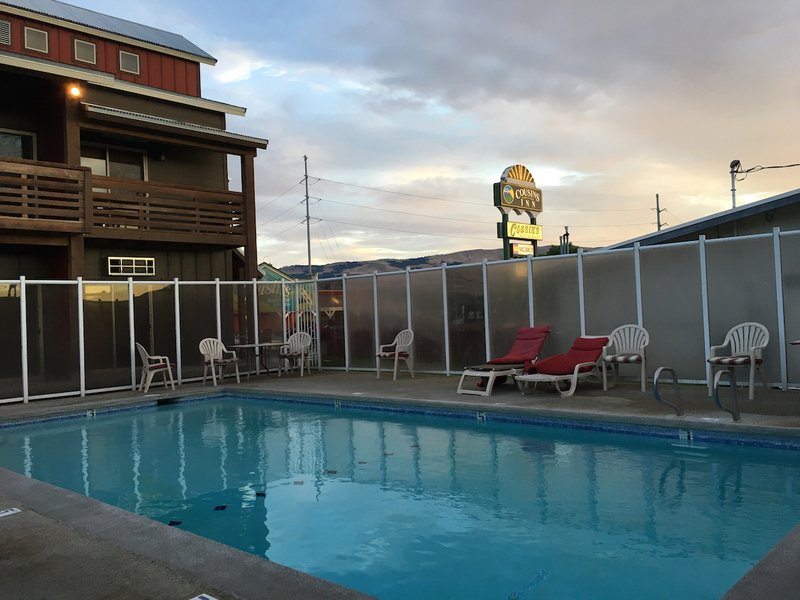 I visited Cousins Country Inn, The Dalles, Oregon, in July. Cousins Country Inn ($-$$) is located at 2114 W. 6th St., The Dalles, Oregon. 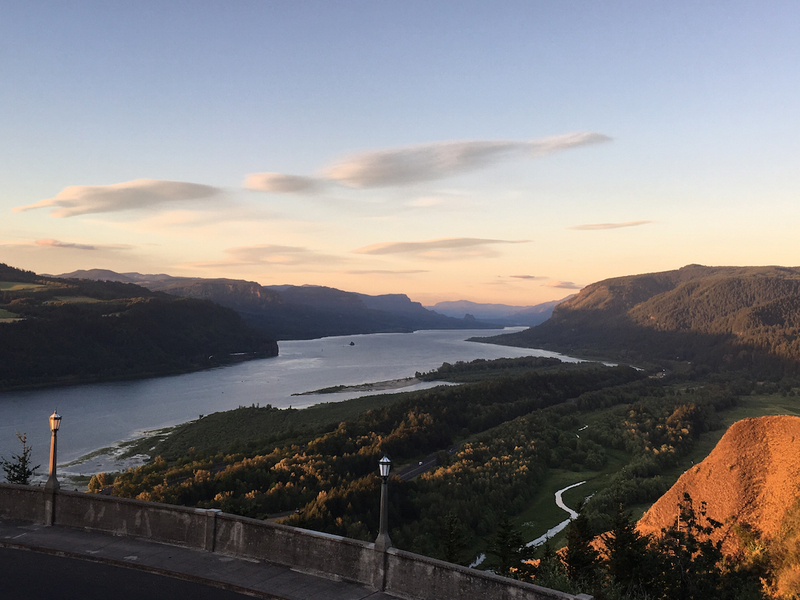 Conveniently located along Interstate 84, it’s ideal as a stopover during a road trip through the scenic Columbia River Gorge National Scenic Area. In front of the lobby, the kids found farm animals to climb all over and a John Deere tractor. Of course we had to take pictures. 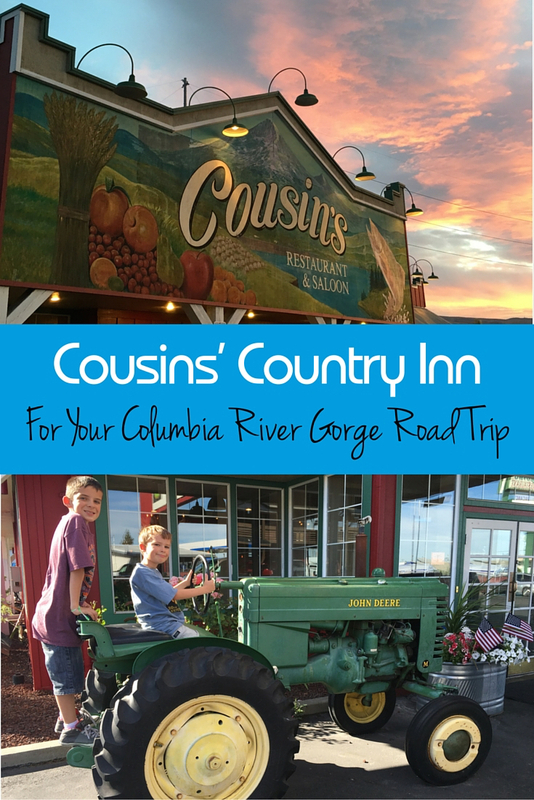 The Cousins Country Restaurant was an easy option since my family had a full day of exploring the Columbia River Gorge National Scenic Area. Cousins Country Inn has road trippers in mind with its clean, comfortable lodging in the middle of a desirable scenic area. The features and amenities are straight-forward and basic, though I found a couple of surprises like complimentary coffee and cookies upon check-in and Tesla charging stations. Cousins Country Inn features an outdoor pool and an enclosed spa. 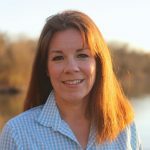 I used the guest laundry during my stay, a nice feature for road trippers. My room at Cousins Country Inn featured two queen beds, a refrigerator, a microwave, an alarm clock, an iron and ironing board and a DVD player. The front desk has a large selection of movies to borrow. My room included a Keurig coffee maker with mugs, a nice feature for a room in this price range. I didn’t expect real glassware with the ice bucket and ceramic mugs at this price point. 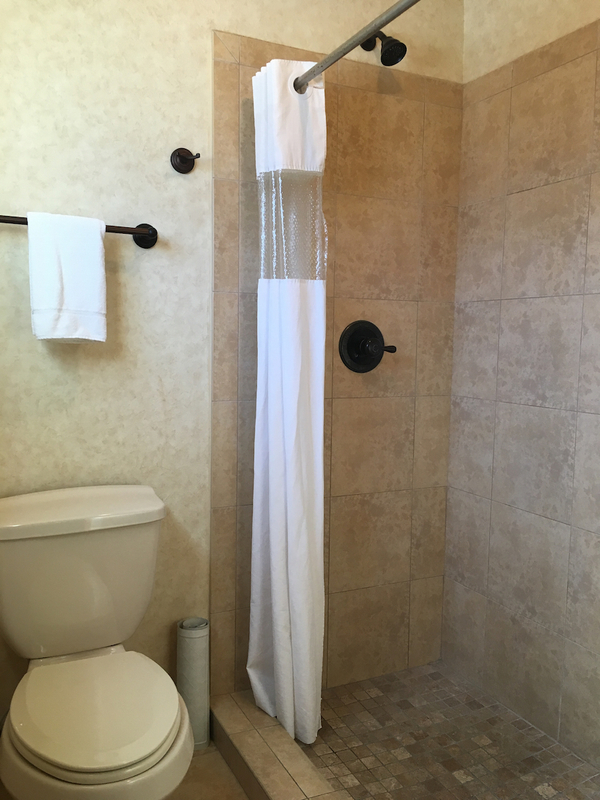 The bathroom in my room at Cousins Country Inn had a large shower, though no tub. The vanity area had one sink with a large countertop along with a hair dryer. The toiletries were nicer than I expected and featured bar soap, shampoo, conditioner and lotion. Cousins Country Inn is located along the Columbia River Gorge National Scenic Area, approximately 80 miles east of Portland International Airport. The Dalles is the last stop on the famed Oregon Trail. Mount Hood is in full view from The Dalles and offers lots of recreation throughout the seasons. The Hood River Valley’s Fruit Loop, a 35-mile scenic loop with orchards and vineyards dotted with lavender fields, is a short drive away. U. S. Route 30 offers several waterfalls close by as well. This road-weary traveler appreciated the Cousins Country Restaurant located in front of the inn. It features family favorites with a kids’ menu and a full bar. I ordered a hamburger along with a kid-pleasing brownie sundae. 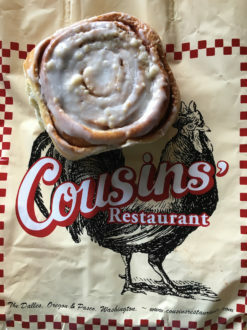 The Cousin Country Restaurant is open for breakfast and lunch as well. Along with traditional breakfast options, I found cinnamon rolls as big as my head. Lodging guests get a discount coupon for the full-service breakfast. Head to the historic downtown area of The Dalles. I saw lots of brew pubs. This area of the Columbia River is known for its windsurfing. I found five Tesla car charging stations at Cousins Country Inn.